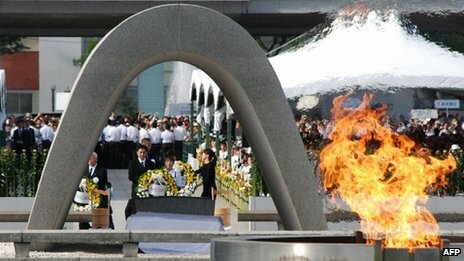 Japan is marking the 67th anniversary of the atomic bomb attack on Hiroshima in an annual ceremony. Tens of thousands of people attended the event, amid growing anti-nuclear sentiment and protests in the country. A bell marked the start of a one-minute silence at 08:15 local time (23:15 GMT) when the US bomber Enola Gay dropped the bomb that killed 140,000 people. Mayor Kazumi Matsui called for a nuclear-free world at the event at the Hiroshima Peace Memorial Park. "I call on the Japanese government to establish without any delay an energy policy that guards the safety and security of the people," he said. Mr Matsui also called for more support for aging survivors of the WW II attack who are battling health issues caused by radiation from the bomb. Prime Minister Yoshihiko Noda, at the ceremony, said the lessons of Hiroshima must not be forgotten. "We will establish an energy mix with which people can feel safe in the long- and medium-term, based on our policy that we will not rely on nuclear power," he said. Mr Noda has been under pressure from anti-nuclear activists since he ordered the restart of two nuclear reactors in June. All 50 of Japan's nuclear plants were shut after the meltdown at Fukushima, which was triggered by a tsunami and earthquake in March 2011. The crisis was regarded as the worst nuclear disaster since Chernobyl in 1986. The ceremony was also attended by a grandson of former US President Harry Truman, who ordered the bombing of Hiroshima and then Nagasaki. Clifton Truman Daniel is the first of the family to attend the annual ceremony. Mr Truman said while it was hard to hear the survivors' stories it was important for his family to understand the full consequence of decisions made by his grandfather, says the BBC's Mariko Oi.